For newbies, there are two main types of climbing you can try: top rope and bouldering. Top rope climbing is what you're probably thinking of when you picture rock climbing. The climber is strapped into a harness and a partner on the ground belays them -- meaning they take in the slack in the rope as the climber ascends -- so the rope is taught and will catch the climber if they fall. Bouldering involves climbing short, more difficult routes called problems. In bouldering, there aren't any ropes. Since they're climbing much lower heights, falling climbers just land on a thick crash pad. Bouldering may be less intimidating for those who are afraid of heights or don't want to worry about belaying, but be aware the routes are more challenging. On a recent weeknight, I decided to give bouldering a try for my first visit to The Edge, which is on Route 9 in Halfmoon. (It's just down the road from the Sportsplex). It boasts 14,000 square feet of climbing terrain and a range of different climbing challenges. As an avid runner and hiker -- though someone who was never able to climb a rope in gym class and has a history of shoulder dislocations -- I was slightly worried about embarrassing myself. But waiver signed, climbing shoes rented, and pointed in the direction of bouldering, I was ready to go. After some nervous circling of the bouldering area, I was delighted to find a section of beginner problems. The bouldering scale of difficulty ranges from V0 (the easiest) to V16 (only a few of these exist in the world), and The Edge, blessedly, has a handful of V0 problems. Each problem is marked with colored tape to show which climbing holds are part of the route. I found the V0 problems to be a doable challenge and was thrilled to complete most of them on the first couple attempts. After an hour of climbing, falling, and watching in awe as more experienced climbers seemingly defied gravity on overhangs and more difficult problems, it was time to call it quits. My forearms may have been shaking on the drive home, but I was already talking about getting a membership. A day pass for The Edge is $12, not including equipment. For bouldering, you'll need to rent shoes for $4. To climb top rope, you'll also need to rent a harness ($4) and belay device ($2). (If you want to try top rope climbing, bring a friend to belay you -- staff will show you how.) There's a rental package including shoes, harness, and belay device for $8. For more info on rates and hours -- and the waiver -- check the website before heading over. The Edge also offers a monthly, three-session climbing 101 class for those who want to learn the basics of indoor rock climbing. Note also that November through March, bouldering is restricted to members only on weekends because of crowds and safety concerns. The rock gym you've probably heard of before, A.I.R. is a large, indoor rock gym off Central Ave in Colonie just over the town line with Albany. In addition to climbing and bouldering, it also has an extensive indoor caving system. A day pass is $12 not including equipment. 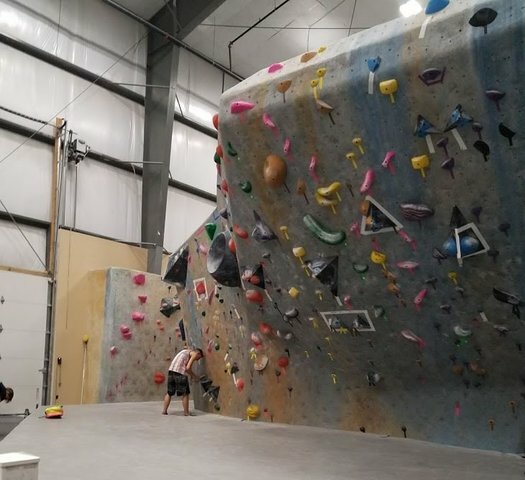 A little farther north in Queensbury, Rocksport offers 4,200 square feet of indoor climbing as well as outdoor guided climbs. If you're looking to venture outside to climb, Rocksport has an experienced team of guides ready to take you to the Adirondacks. A day pass is $12 not including equipment. While The Court Club is known for its racquetball, squash, and handball, the facility just off Wolf Road also offers rock climbing. Since it's not a dedicated climbing gym, the climbing section is smaller than the above options, but they do have a four-sided, 25-foot-tall climbing tower. You do not need to be a member to rock climb. A day pass is $10, not including equipment. If you're already a member at Vent, an easy way to try climbing is at the gym chain's Guilderland location, which features a 30-foot climbing wall. Beginner classes are available, and once passing a certification, you can climb on your own using an auto-belay device. Climbing is for members only, and is included in Level II and III memberships, and $5 for level I members. Anyone with kids try any of these places? I know many seem to have age restrictions, but I have a 7 year old SUPER into climbing! @Melissa-- The Edge has a very family-friendly vibe (lots of kids scampering up walls), and they host birthday parties for kids as young as 5. I would call to confirm, but I'm thinking 7 is probably good to go for supervised climbing! This article was a great opportunity to promote a wonderful sport that can be enjoyed your round, but All Over Albany is supposed to be about Albany. The edge is in Halfmoon n. Albany has an amazing indoor rock gym which you only gave a brief mention to at the bottom as if it was a poor stepsister.